It seems we're all in a hurry after Halloween to jump right into gift-buying. It makes sense--many of us are on a budget or are at a loss on what to buy and need all the time we can get to find that perfect "something" for our friends and family members. And, of course, if you're in the retail business--as we are at Artisans Alley--then you know that the holiday buying season is crucial to that bottom line every year. Still, we sometimes tend to skate right past Thanksgiving with little more than a cursory glance, and that's a shame. It's such a wonderful time to simply enjoy being together with our loved ones: sharing delicious foods, enjoying sports rivalries, cuddling on the sofa and watching parades and movies, filling our homes with delicious aromas and heartfelt laughter. So this year, plan to give Thanksgiving the love it deserves...the love you deserve. My boyfriend Andy has provided a yummy recipe to get you started! For the dough: warm the milk and butter together over the stove or in the microwave. Warm the two together until the butter is just melted. The mixture should be lukewarm (105-115 F degrees). Set aside. Using your stand mixer fitted with a paddle attachment, beat the pumpkin puree, brown sugar, nutmeg, and salt together on medium speed. Add the warmed milk/butter and beat until combined, then beat in the egg and yeast. With the mixer running on low speed, add 1 cup of flour. Mix for 1 minute, scraping down the sides of the bowl frequently. Add 1¼ cups more flour and beat for 1 more minute. The dough will be very soft. Place dough into a greased bowl (a bit of olive oil or nonstick spray to grease works). Turn the dough around in the bowl so all sides of it are coated. Cover tightly with plastic wrap and allow to rise in a warm, draft-free environment until doubled in size. This will take about 1 to 1.5 hours. Preheat the oven on to 250°F. Turn the oven off. Place the covered dough inside the oven and allow it to rise in this warm environment. Gently punch the dough down to deflate it and turn it out onto a lightly floured surface. Knead the dough a few times so it is smooth. If it is too sticky, knead in a little more flour. Add the filling: Combine the brown sugar, cinnamon, and spices into a small bowl. Roll the dough out into an 18x10 inch rectangle. Spread the softened butter evenly on top. Sprinkle all the filling over the top. Roll it up tightly. Using a very sharp knife, cut into 101-12 pieces, about 1½ inches each. Arrange rolls into a greased 9-inch or 11x7- inch pan. Cover with plastic wrap and allow the rolls to rise again in a warm, draft-free environment until doubled in size. This takes about 1 hour. Preheat oven to 350°F. Bake the rolls for 22-28 minutes, covering with aluminum foil at the 15-minute mark to prevent heavy browning. Remove from oven and allow to slightly cool as you prepare the icing. Icing: Melt the butter in a saucepan; stir in the brown sugar and milk. Cook and stir over medium-low heat for 1 minute. Stir in the vanilla, salt, and ¼ cup confectioners' sugar; beat until well blended. Add more sugar, if necessary, to achieve desired consistency. Drizzle over the rolls. Andy’s Cinnamon-Pumpkin Buns sounds so YUMMY. I'm going to have to give them a try for sure. 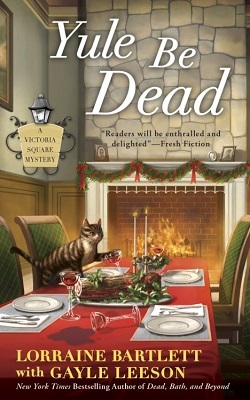 Can't wait for the opportunity to read "YULE BE DEAD". I'm extremely grateful for the people in my life (especially my loving husband of 35+ years) and hopefully I show them all year that I am. It is good though to have a little reminder in the form of a holiday to remind us to stop, slow down and really realize how fortunate we are and to give thanks for our many blessings. Thank you for the yummy recipe. I will have to try it. Thank you for the recipe. Looking forward to the book.